Section 508 Compliance, ADA & WCAG 2.0 - Daily Tech Update – March 26, 2018 | Blue Mountain Data Systems Inc.
INDUSTRY INSIGHT: How Does the Refreshed Section 508 Rule Affect Your Agency? Here’s what’s changed in the refresh and how the refresh affects agency systems. If agencies complied with the original Section 508 rule, then they are ahead of the game concerning the refreshed rule. Simply put – agencies that were compliant are still compliant because there is a “safe harbor” clause embedded in the new rule that exempts existing or “legacy” IT from having to meet the refreshed rule. Keep in mind, though, that new or updated web pages created after the new rule went into effect should have complied with the new rule by January of 2018. Read more. WEBSITE COMPLIANCE TIPS: 17 Website Adjustments You Can Make Today for Better Accessibility. Owners of brick and mortar stores, restaurants and office buildings are required by law to accommodate the needs of customers with disabilities via wheelchair ramps, braille product signage, accessible restrooms, and more. 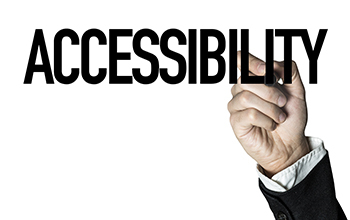 As a public-facing website owner, you are required to have a website that is accessible as well. Read more. REGISTER NOW: Website Accessibility Auditor: Learn How to Test Websites for Accessibility. This 2-day online instructor-led hands-on course covers essential design, coding, and testing procedures for Web designers and developers who want to be sure the sites they create or maintain are accessible to as many people as possible. Class participants will learn how to test a website for accessibility, based on Section 508 Compliance & WCAG 2.0 Standards…Levels A, AA & AAA. This class also includes a discussion of the recently-released WCAG 2.1 draft and what the current proposed changes mean for people with disabilities and website accessibility auditors. Register now.